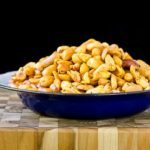 Spice up your next party with these Sriracha Spiced Peanuts. They are a festive, quick and easy to make an appetizer with a kick of heat and touch of sweet. Place peanuts in a medium bowl. Stir together butter, sriracha seasoning, and brown sugar. Pour over peanuts and stir to coat. Spread peanuts out in single layer on a rimmed baking sheet. Bake for 10 minutes, stirring half way through baking.